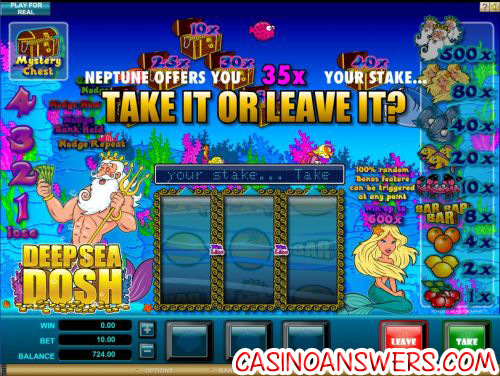 Deep Sea Dosh Fruit Machine Guide & Review - Casino Answers! Deep Sea Dosh is a 3-reel, 1-line AWP fruit machine slot found at Microgaming casinos including King Neptunes Casino and Wild Jack Casino. It has unique fruit machine features such as nudging, holding, Shifta and Let ’em Spin as well as a bonus game.Play at this years #1 online casino for United States - Slots.LV. Deep Sea Dosh has an obvious underwater theme to it. The main character is King Neptune (technically unrelated to King Neptunes Casino, but it’s a neat little tie-in). He is the booming voice of the slot machine and will announce when you’ve trigged one of Deep Sea Dosh’s many special features. The slot has an animated background with a bunch of different fish swimming around aswell as a shark grinning rather evilly. There’s also a mermaid sitting in the bottom right. Symbols in Deep Sea Dosh are in order of highest to lowest value: King Neptune (who can win you the 500X top jackpot), the mermaid (80X), clams (40X), fish (20X), crabs (10X), bar symbols (8X), oranges (4X), lemons (2X) and cherries (1X). The full paytable is listed to the right of the slot machine game. Deep Sea Dosh’s intro video begins with a bunch of fish trying to open a treasure chest, failing, and then a shark swooping down to take the prize. King Neptune then alerts you that you can win 600X in the treasure chest bonus game. Bets on the Deep Sea fruit machine are $0.10, $0.20, $0.25, $0.50, $1, $2, $5 and $10. This is a single line slot machine so your coin value is also your total bet per spin. We like it sometimes when things are kept simple and we don’t have to take out the calculator to work out how much we should bet. Of course, as it’s a single line pub slot, you only need to worry about looking at that center line. All other symbols that aren’t along the center unfortunately mean nothing unless you’re able to nudge that reel. Like most fruit machines, Deep Sea Dosh has a nudge feature. This is a random feature that gives you the ability to bump a reel down to the next symbol so that the symbol above the line bumps into the center line, perhaps creating a new winning combination. You can win up to four nudges, and these can be banked, repeated or gambled. Deep Sea Dosh also has the hold feature. Using the hold feature, you can hold however many of the reels you wish inorder to increase your chances of a winning combination on the next spin. Another random feature on the Deep Sea Dosh AWP is the Shifta feature. This is a much-desired feature because it will automatically spin the reels to a winning combination! Another one of Deep Sea Dosh’s features is similar to Shifta. When two of the same symbols are displayed on the payline after you have used all of your nudges, Let’em Spin can randomly be triggered. Click the Spin button without holding any of the reels to automatically spin a winning combination. You can’t get much better than an automatic win, can you? Yes, you can! Deep Sea Dosh has a randomly triggered Treasure Chest – Take it or Leave it bonus game! The game is very similar to Deal or No Deal. In the bonus game, you can win a top prize of 600X. In the game, sixteen treasure chests are opened with a multiplier value. For each round of the bonus game, five of these chests will be removed randomly. King Neptune will give you an offer and you have the choice of accepting or rejecting it. If you accept his offer, the game will end and you will win your bet amount X multiplier. If you decide to reject his offer, five more will be removed and you will be given a new offer. The game is played until only one chest remains. At this point, you can either choose to take the chest with the multiplier visible or the mystery chest with a mystery multiplier value. The Deep Sea Dosh Treasure Chest bonus game is an excellent game, with simple rules and easy enough to play. Plus, the chance to take home a big win! 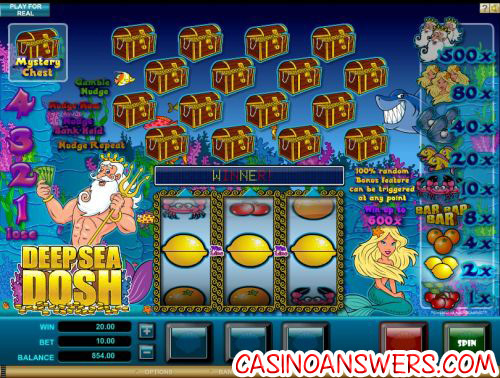 Deep Sea Dosh is an excellent fruit machine from Microgaming. It has a ton of special features, such as the nudge, hold and Shifa features, and the bonus game is triggered fairly frequently, unlike some of the other AWPs out there. Take advantage of a 100% up to $100 signup bonus offer to play the Deep Sea Dosh pub slot machine over at King Neptunes Casino! Are Microgaming casinos that feature Deep Sea Dosh taking US players? Unfortunately, Microgaming casinos are currently closed to US players. Players from the United States can play all of the slots they like at VIP Slots Casino. Fruit machines (also known as pub slots or one-armed bandits and formally known as Amusement with Prizes) are commonly found in pubs, clubs and arcades in the United Kingdom. They are different from your classic slot machine found in North America due to the fact that they have special features such as nudges, holds and more. You can find plenty of these fruit machines at online casinos using the Microgaming software platform, such as Wild Jack Casino. What is the best strategy for the fruit machine Deep Sea Dosh? What information is there on the Deep Sea Dosh fruit machine? Deep Sea Dosh Fruit Machine Review?